The review leads you through the features to look for, and advanced technology that provides efficient and reliable heating, yet flexible, safe and comfortable for you and your family. Rinnai V65 models are non-condensing and tankless water heaters that, due to its intelligent design, bring high efficient and superior water heating, heating water on demand, continually delivering hot water to one or multiple fixtures, while saving the space, water, and energy. Except for residential homes, V65 models are certified for installation in mobile homes as well. They are compact, small and lightweight that does not occupy any floor space but are easy to install on the wall and thanks to simple commands, use. There are four models to choose from, which can be installed inside the house or outside, using natural gas or propane gas. Rinnai V65 tankless water heaters are designed with the maximum water flow of 6.5 gallons per minute so they can supply two to four applications at the same time, making them ideal not only for point-of-use-service but whole-house heating. If more hot water is needed, you can use EZConnect cable to connect two indoor models to work as one, but this is optional. Due to its simple design, V65 models do not have an option for recirculation, but if you require faster hot water delivery, we recommend you to check the RUR98 or RUC98 models, they are the best of Rinnai. An indoor unit V65i is a direct vent water heater with sealed combustion that uses a vent system to bring the outside air in for gas combustion and move the exhaust gases out, making it safe to use inside the home (bathrooms and kitchen). While an indoor model uses the venting system with the horizontal or vertical termination, an outside model V65e doesn't require any venting since it is ventless and mounted outside. It can be installed inside the recessed box for better look and protection. Rinnai V65 models are designed to work with the maximum power of 120,000 BTU making the whole-house water heating possible, while the minimum power they can get is approximately 10,300 BTU which is mostly used in point-of-use applications. This is possible as the units are equipped with the modulating gas burner, which adjusts the power based on the set temperature and water flow. A modulating burner ensures consistent temperature with less hot water temperature fluctuation (cold water sandwich) and higher energy savings. According to the Energy Guide, an estimated yearly energy cost is close to $200 when the natural gas is used and around $480 with the propane. The temperature controller MC-91-2US is built into the front panel of the indoor model while it is provided with the outdoor unit. The controller offers better control of the outgoing hot water temperature, and by using the diagnostics system, it can display error codes when the problem occurs, making the troubleshooting easier. If the provided controller is used, the temperature can be set between 98 and 140 F, but if you need higher temperature for the hydronic heating, install the MCC-91-2 controller which allows you to set it up to the maximum temperature of 160 F.
If the water heater does not use the temperature controller, then the temperature can be adjusted by putting the switch in the correct position. Every tankless water heater from Rinnai, including V65, is Wi-Fi capable of making the remote control and monitoring possible. Rinnai V65 water heater is continually checking water heating operation. If there is a problem with the heater, error codes such as 0.2, 0.3, 11 or any other, will display on the remote control, if it is installed. If it is not installed, then the error code will flash on the control panel. Flame rod - the water heater will automatically shut down if the burner flame goes out. Overcurrent protection - if the fuse blows all the lamps will be OFF. Thermal fuse will break if the overheat feature does not prevent the temperature from rising, and will shut off the unit. The energy factor is 0.82 for both indoor and outdoor units. Temperature setting is from 98-140 F. The units are factory set to 120 F.
The heater meets California and Texas NOx emission requirements. Direct electronic ignition instead of the pilot light. Gas and water fitting size is 3/4" which is a standard size. Water pressure range is from 20-150 PSI. Certified for mobile and manufactured home installations. Hot water capacity is from 0.6 to 5.3 GPM. Warranty is 10 years on heat exchangers for residential and hydronic applications, with an option to increase to 12 years with the installation of the isolation valves. 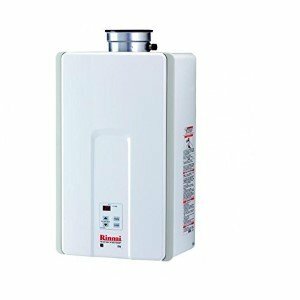 Rinnai V65 is an excellent solution for the homeowners who need a reliable tankless water heater that supplies hot water with a consistent temperature, on demand, and for up to four applications. High efficient operation ensures better energy savings and reduced heat loss. It is recommended for small and mid-sized houses and budget oriented families.